Hi! 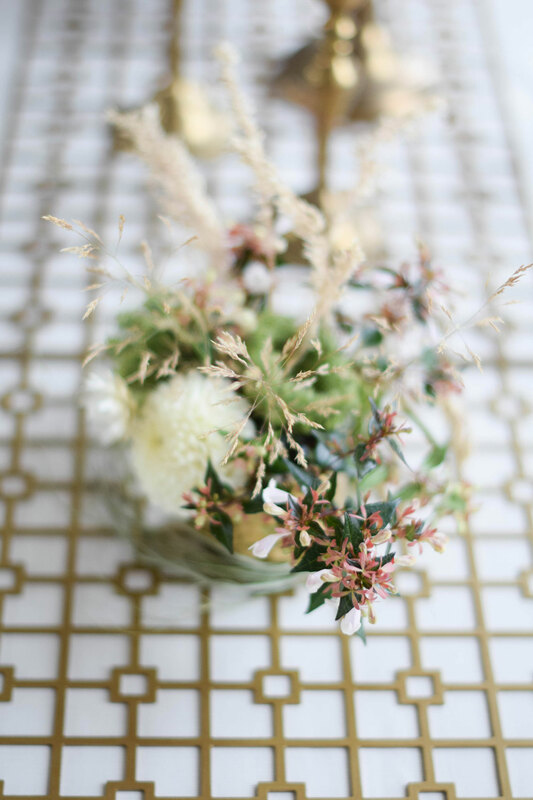 I’m Emily Ellen Anderson, creative director at Lola Creative, a Seattle based event design company, and head educator at Curious Lola, an online learning platform for floral designers. We specialize in creating artful events and teaching the nuts and bolts on our blog Curious Lola. 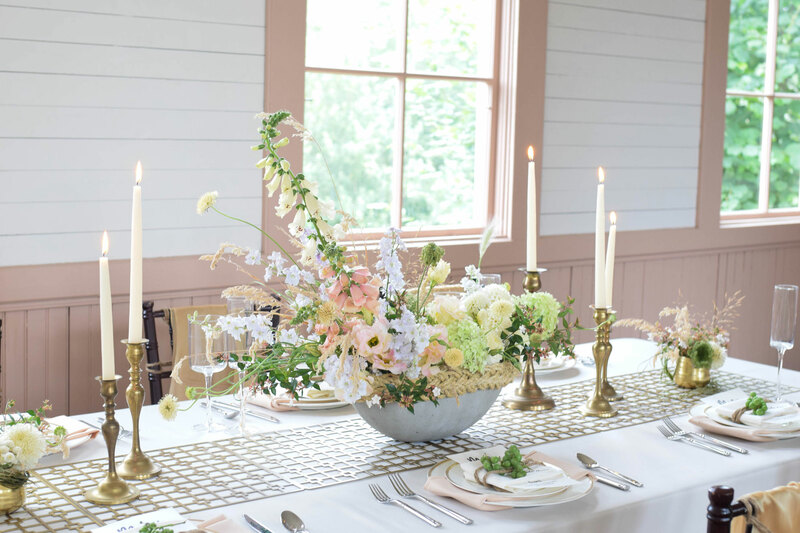 BBJ Linen kindly asked me to be a guest blogger here on Table Talk, and I couldn’t be more thrilled! If you already follow Curious Lola, then you that I have an insatiable appetite for learning and sharing my knowledge on new techniques to create impactful events. This week I will describe the top three ways I to choose a look and create a cohesive theme. I hope you enjoy! Too little repetition can be chaos- no one wants a ‘HOT MESS’ theme. 1. What do I have just laying around? I’m just going to go ahead and say it. There’s a large portion of my work that is inspired by…. What I have a lot of. What do I have an abundance of? What is seasonal? What I can repurpose? What is just in my way and needs to get out of my studio right now!?! This time it was grasses. As we near the end of summer, I love how heat slows everything down. The slow, laziness and the light of the season is amplified by thousands of grasses wafting in the hot breeze and the sun glowing through the golden seed heads. Lovely. Which is convenient because, truthfully, I had a lot of grassy weeds growing along my street! Lovely and free. 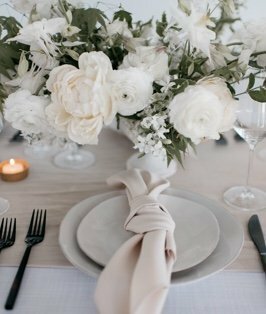 PS, if you are a floral designer, read all the way to the bottom to get your bonus recipe for all the flowers featured in this article. 2. In What World Will This Scene Take Place? • Have simple shapes so the high diversity doesn’t get overwhelming. • Control color contrasts so the high diversity is not overwhelming. • Focus on texture. Contrasts are again another thing that catches attention, but texture is a subtle thing- so if it’s texture you are going for, best to keep color and shape contrast to a low to moderate level. Otherwise it’s overshadowed. • Less things. 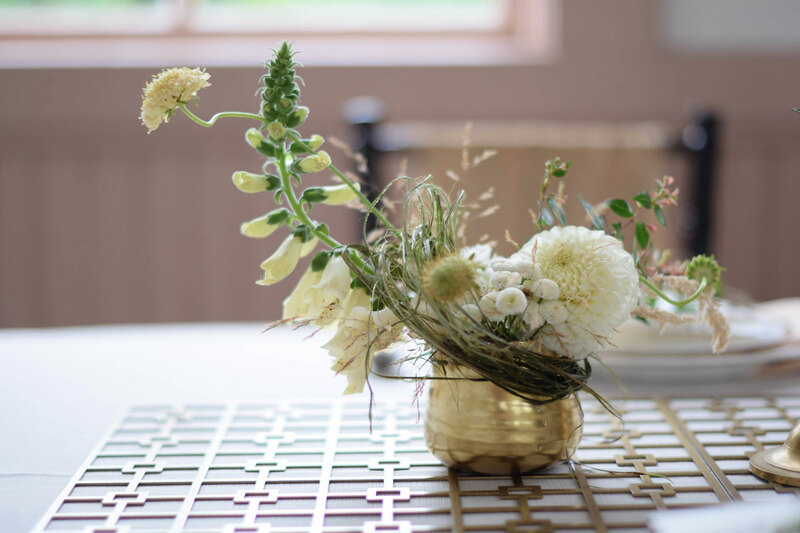 Again with the contrasts, we are going to have a lot of different types of flowers to best to have less things on the table so we can focus on the contrasts that we want to amplify. 3. What’s Our Third Thread? This one’s a little vague. Really we are just looking for an unexpected element that we can use in several details to again have that repetition in the scene. For this I use word associations. 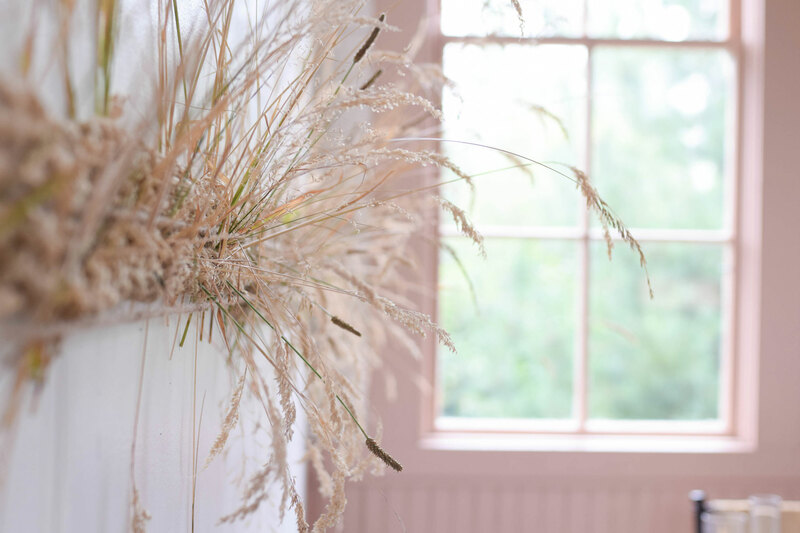 If meadow and grasses are a yes, then what else would live in that world? Here’s what that stream might look like: butterflies, clouds, trees, girl in dress, messy braids and maxi dress, picnic on blanket, deer, rabbits, sunshine. Messy braids sounded interesting to me. We didn’t have a model for this shoot, but we could weave grass into braids. What better image for a carefree, end of summer state of mind than a girl with a messy braid? We tried that and it looked, well, bad. So went with rope. 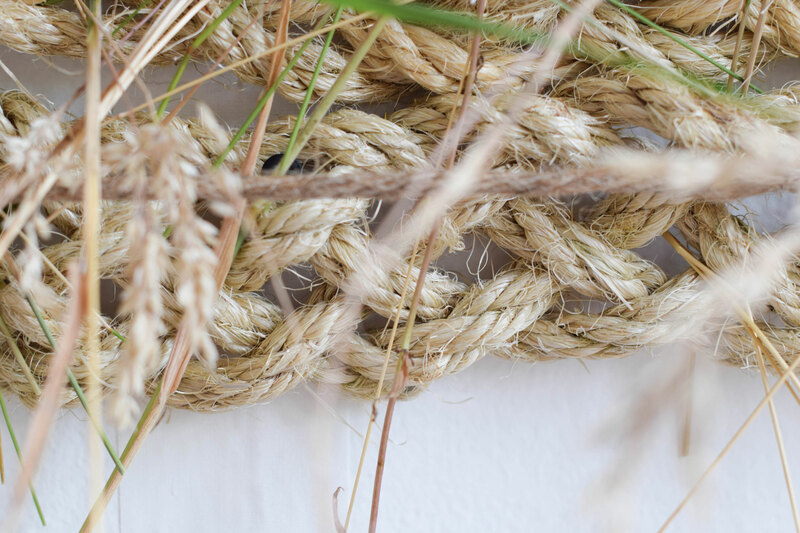 To add a bit of the unexpected, we searched YouTube for some more challenging multi-strand braids and landed on this 5-strand braid that we could make with rope. Et voila! 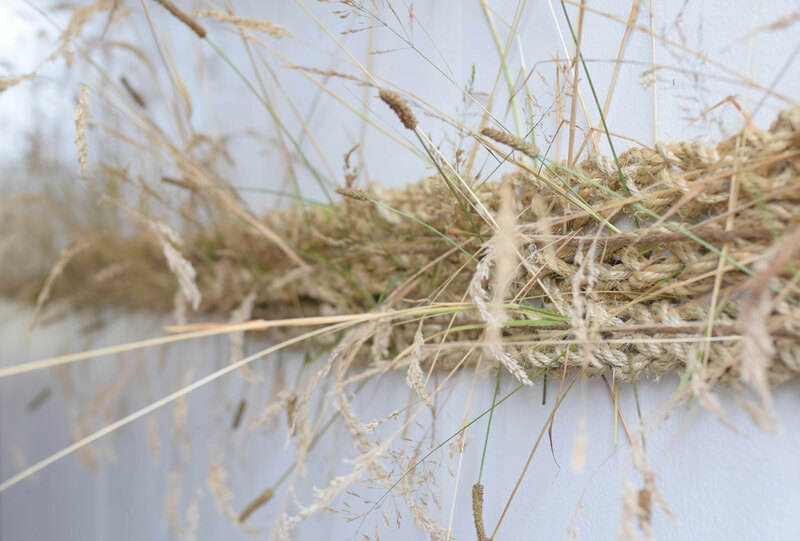 Our trifecta of grasses, meadow and braids for this photoshoot. PS: another tip, if you are in a bind for inspo, is to just grab your BBJ Linen swatch book and mix and match the gazillion (probably) texture, color, and pattern swatch choices. We use them even when we aren’t trying to figure out linen. What I love about BBJ is not only their crazy-wide range of linen AND accessory styles and sizes, but the texture and feel of their linen. 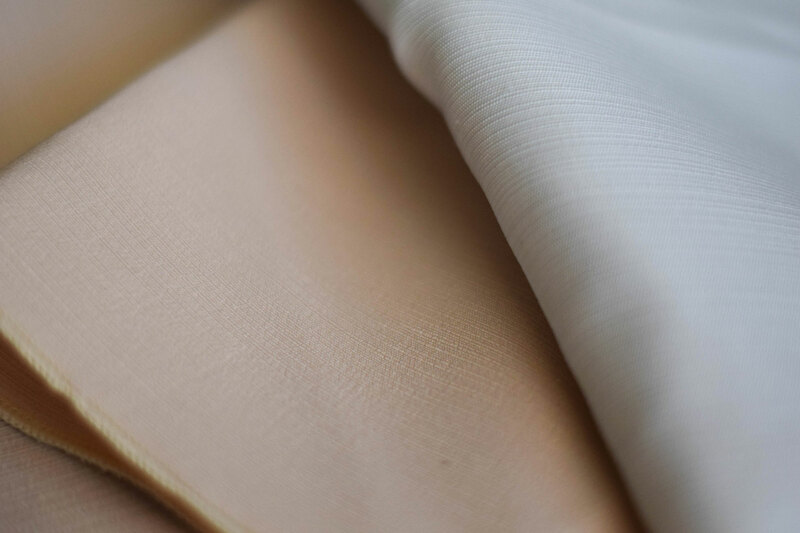 When a linen has this kind of weight and texture, it’s special. And that feel good box is checked over and over each time the guest touches it. 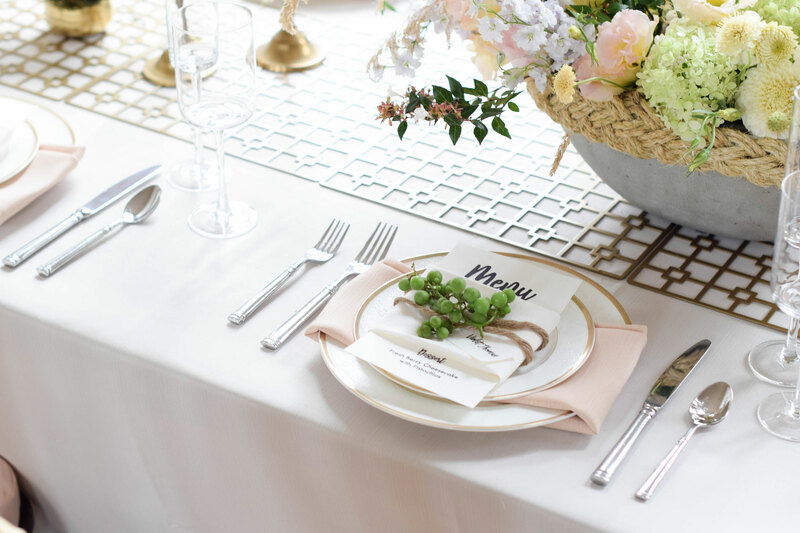 We opted for the Gold Deco metal placements and used them as a table runner to add a modern edge to an otherwise entirely soft romantic look. 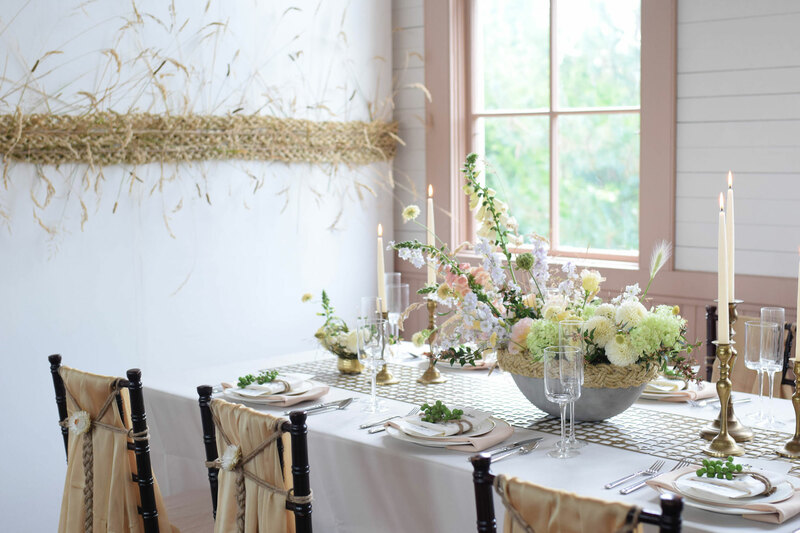 The linens are the indescribable faille table linen in cloud with peach faille napkin. 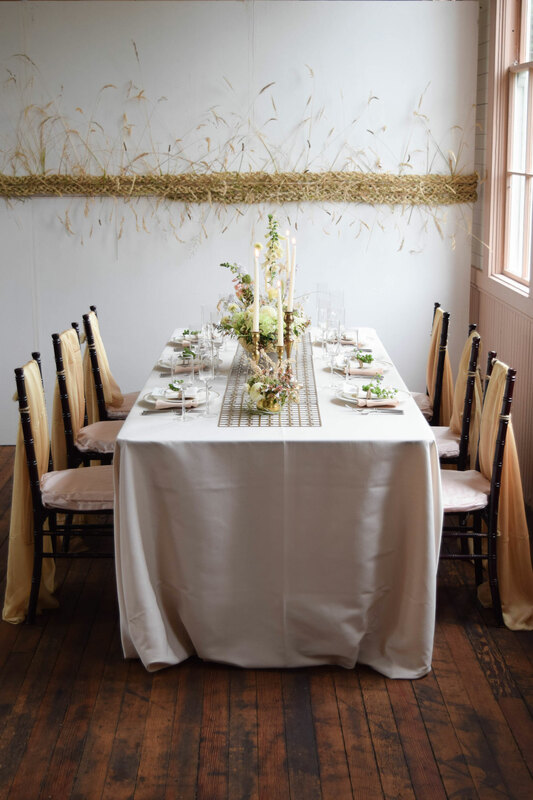 Also featured is the Shantung Sham in cameo and the Graceful chair drape in gold. The Faille linen in cloud is alluring and sophisticated. 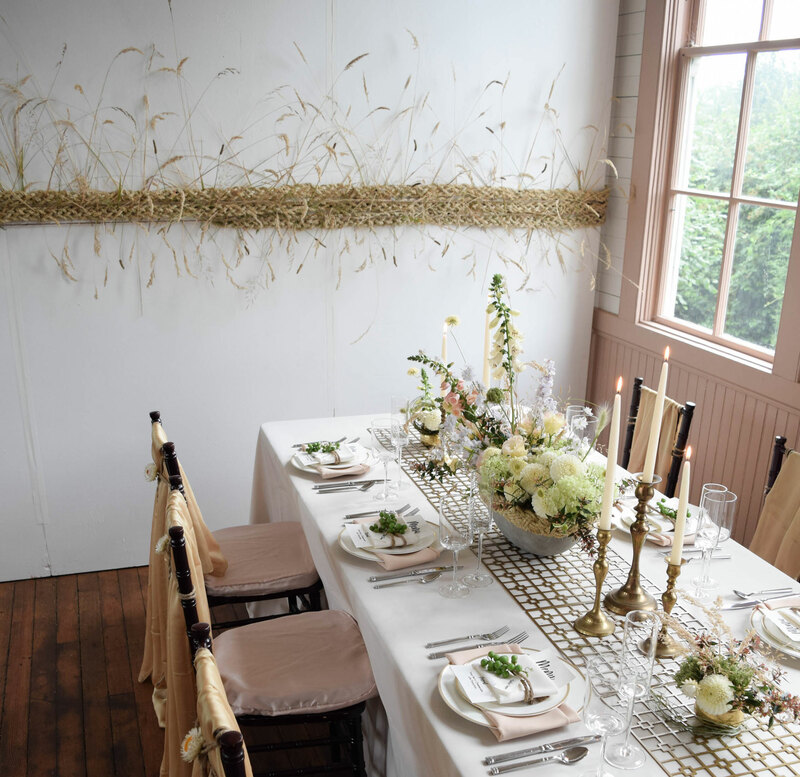 It would be equally at home in a loft or in a textural-slightly boho vibe such as this. 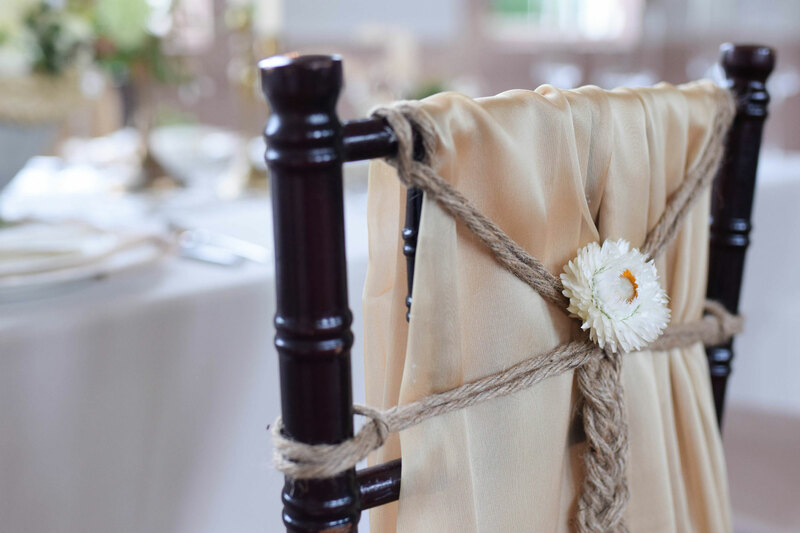 We braided jute down the back of the chairs for a way to keep the drape in place and provide a unique detail. This look is achieved with three finished strands laid side by side. Each strand is sisal rope braided with a 5-strand technique that we found on youtube hair demonstrations. 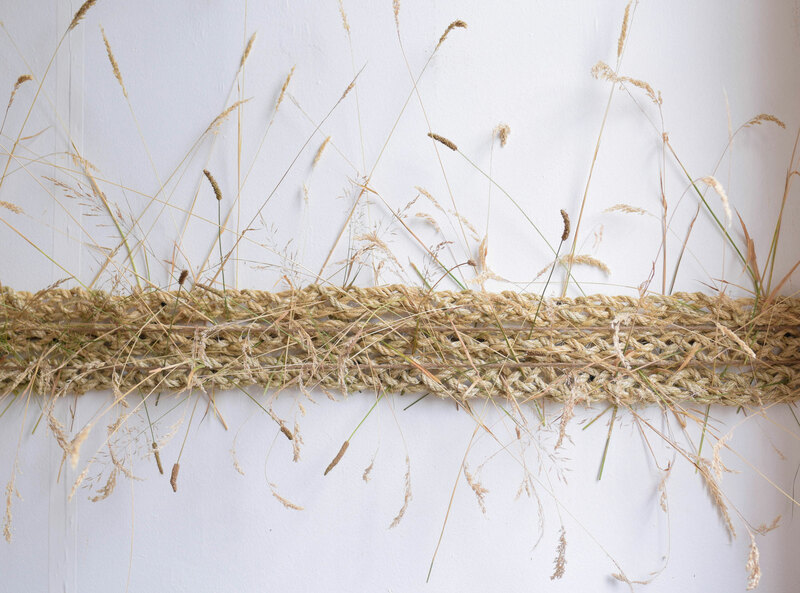 The grass is simply woven into the weave in a pattern of natural chaos. 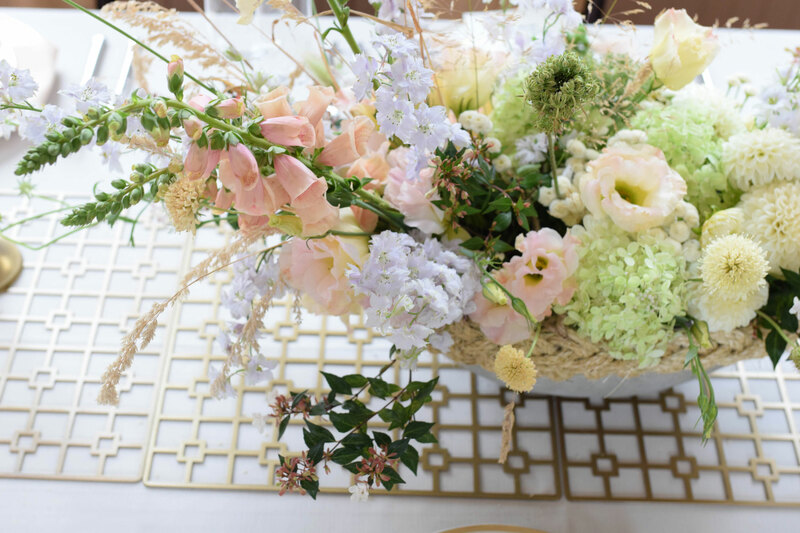 The flowers were designed to catch light and create a diverse palette of textures. The colors are muted to make texture the star. Click below for your complete recipe including quantities and wholesale pricing for these arrangements. The flowers are a mix of entirely local, seasonal, and sustainably grown flowers. Don’t fret if you don’t have access to these varieties, I’ll show you how to substitute. In the download. This recipe is provided to you by me, Emily Ellen Anderson of Curious Lola. 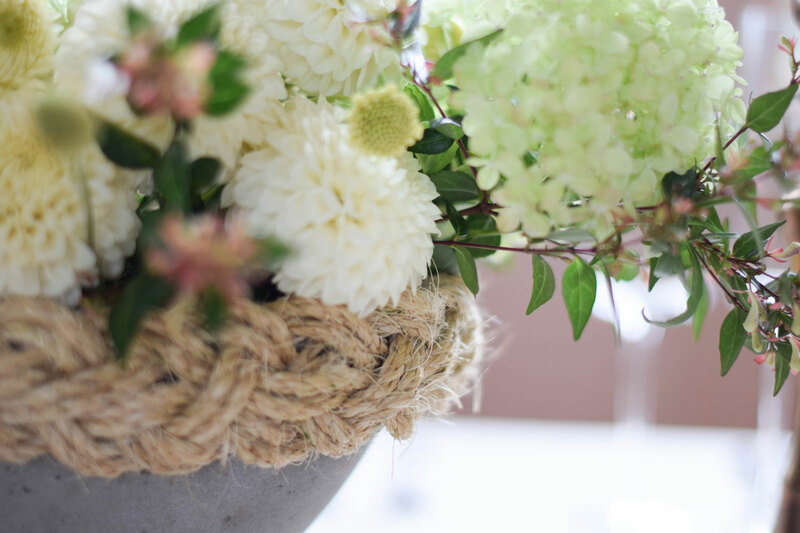 Currently we are sharing with floral designers our tips on how to price floral designs. For your free download of this recipe including quantities and pricing click here.